How can we take advantage of new communication technologies in creating more prolific change while reaching far more people than we ever could have imagined? There is little reason to believe that people with a broken wrist or inflamed tonsils want to become part of a social network of people who share the same transient health issue. So what are the types of issues that are appropriate for online communities and social networks to address? Ethnic minority or lower-income populations experience monumental economic and cultural challenges to healthy eating, physical activity participation, and many other health protective behaviors. Such barriers are inherent in the physical, social, organizational, and political environments of underserved communities. ACSM’s Worksite Health Handbook, Second Edition, has been thoroughly updated with the latest research and expanded to better support the business case for worksite programs. The text provides information on important contextual issues, evidence of effectiveness, assessment, program design, and strategies for encouraging employee involvement. Encouraging and maintaining a healthy workforce have become key components in the challege to reduce health care expenditures and health-related productivity losses. As companies more fully realize the impact of healthy workers on the financial health of their organization, health promotion professionals seek support to design and implement interventions that generate improvements in workers’ health and business performance. 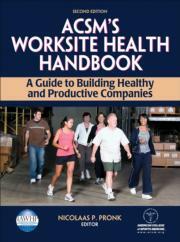 The second edition of ACSM’s Worksite Health Handbook: A Guide to Building Healthy and Productive Companies connects worksite health research and practice to offer health promotion professionals the information, ideas, and approaches to provide affordable, scalable, and sustainable solutions for the organizations they serve. Thoroughly updated with the latest research and expanded to better support the business case for worksite programs, the second edition of ACSM’s Worksite Health Handbook includes the contributions of nearly 100 of the top researchers and practitioners in the field from Canada, Europe, and the United States. The book’s mix of research, evidence, and practice makes it a definitive and comprehensive resource on worksite health promotion, productivity management, disease prevention, and chronic disease management. The book includes a chapter that covers the implementation process step by step so that you can see how all of the components fit together in the creation of a complete program. You’ll also find four in-depth case studies that offer innovative perspectives on implementing programs in a variety of work settings. Each case study includes a profile of the company, a description of the program and the program goals, information on the population being served, the results of the program, and a summary or discussion of the program. Throughout the book you’ll find practical ideas, approaches, and solutions for implementation as well as examples of best practices and successful programs that will support your efforts in creating interventions that improve both workers’ health and business performance. Professional reference for worksite health promotion professionals, supplemental text for upper-undergraduate and beginning graduate students in health promotion programs. Nicolaas P. Pronk, PhD, is the vice president of health management at HealthPartners in Bloomington, Minnesota, the largest consumer-governed, nonprofit health care organization in the nation. He is also senior research investigator at HealthPartners Research Foundation and health science officer of JourneyWell, a Minneapolis-based nationwide provider of health and wellness programs. Pronk has 20 years of experience in the health promotion field as a researcher, developer, and administrator of health promotion programs and services. Since 1993 he has directed health improvement initiatives that involve a systems approach to generating health across multiple sectors, including business and industry. He is a member of the distinguished Task Force on Community Preventive Services, an independent panel supported by the Centers for Disease Control and Prevention, which presents evidence-based recommendations to the health field. A member of the American College of Sports Medicine (ACSM) since 1984, Pronk served as section editor and contributor for the first edition of ACSM's Worksite Health Promotion Manual. He currently serves as associate editor for the ACSM's Health & Fitness Journal. He served as the chair for the ACSM Interest Group on Worksite Health Promotion until 2008, when it morphed into the International Association for Worksite Health Promotion (IAWHP), an ACSM affiliate society. Pronk is a founding member and inaugural president of the international board of directors for the IAWHP. Previously, he was a board member of the former Association for Worksite Health Promotion (AWHP). Pronk and his wife, Stephanie, reside in Eagan, Minnesota. He enjoys spending time with his family and dogs, watching English Football Association soccer after a Saturday-morning run, and riding his Harley on country roads in the Minnesota northland. ACSM advances and integrates scientific research to provide educational and practical applications of exercise science and sports medicine. The American College of Sports Medicine, founded in 1954, is a professional membership society with more than 20,000 national, regional, and international members in more than 70 countries dedicated to improving health through science, education, and medicine. ACSM members work in a wide range of medical specialties, allied health professions, and scientific disciplines. Our members are committed to the diagnosis, treatment, and prevention of sport-related injuries and the advancement of the science of exercise. Our members' diversity and expertise make ACSM the largest, most respected sports medicine and exercise science organization in the world. From astronauts and athletes to people with chronic diseases or physical challenges, ACSM continues to look for and find better methods to allow people to live longer and more productive lives. ACSM is leading the way in exercise science and sports medicine. -ACSM publishes periodicals such as Medicine & Science in Sports & Exercise, Sports Medicine Bulletin, Exercise and Sport Sciences Reviews, ACSM's Health & Fitness Journal, Current Sports Medicine Reports, and the online consumer newsletter ACSM Fit Society Page. -The ACSM Web site, www.acsm.org, serves as a portal to research, information, and professional development resources. -Meetings present the latest scientific research and practical and clinical applications as well as fitness techniques and public health issues. -Through media outreach, ACSM experts provide accurate, evidence-based insight into sports medicine, exercise science, and health and fitness. -Books, pamphlets, and other publications present consumer advice, standards and guidelines for practitioners, and other definitive iinformation.